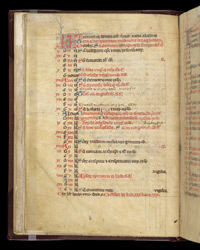 The rubric of the prologue to the main text describes this book as 'The book of things to be remembered about the conventual church of Barnwell'. It is a collection of material relating to the history and organisation of the Augustinian priory of St. Giles, Barnwell, on the outskirts of Cambridge. Almost exactly half-way down this page, on 15 October, is the red-letter entry 'Commemoration of the relics of the church of Barnwell. Principal feast'.